In 2005, children under 6 living in Urban census metropolitan areas (CMAs) were more likely to live in low-income families than were those in urban non-census metropolitan areas. This was the case for First Nations children with registered Indian status, without status or Non-Indigenous children. 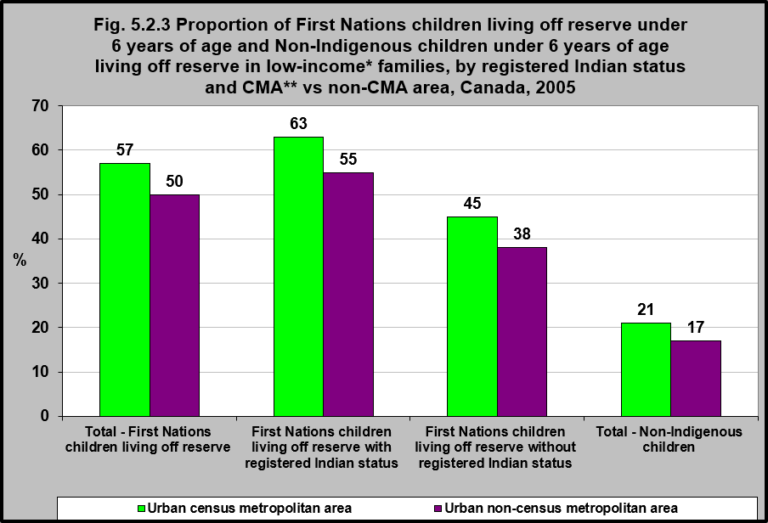 However, non-Indigenous children living in CMAs were less likely to live in low-income families than were First Nations children either with or without registered Indian status. 1Walks, A. (2013). Income inequality and polarization in Canada’s cities: An examination and new form of measurement. Toronto, ON: University of Toronto, Cities Centre, Research paper 227, p. 3 and 91.